We’ve got lots of fan made Simpsons stuff this week, from YouTube videos, to Lego statues, to unsourced artwork. There’s also a political divide I feel no hesitation to take sides on, some excellent Zombie Simpsons hate, Aurora Indianalis, a clever New Zealand marketing ploy, and plenty of usage of all varieties. Enjoy. Whoops! is funny in a Jeremy Clarkson sort of way. In other words it is larded with leaden similes and blokeish "wit". 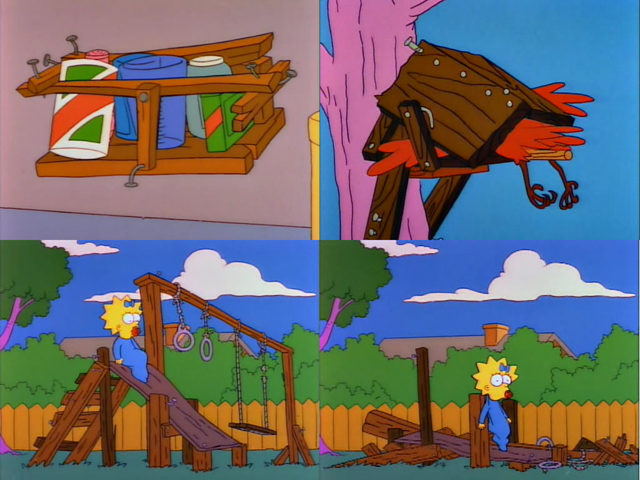 So, for example, a complex but entirely accurate description of the construction of collateralised debt obligations is interrupted by such ­observations as "the initial lender was free to quote Bart Simpson: ‘sayonara, sucker’." I don’t know who Jeremy Clarkson is, but to my knowledge Bart has never said “sayonara, sucker”. Bad book author, bad. Lisa: Look on the bright side, Dad. Did you know that the Chinese use the same word for “crisis” as they do for “opportunity”? It’s an excellent and appropriate sentiment, but a big miss on the execution. Weekly Best Of: The Best Fictional Bands/Songs From TV – The Be Sharps make an appearance. Homer Simpson – Just a bunch of Homer Simpson background images for your computer. D’oh! – There is at least one person who doesn’t know who Bart Simpson is. I Never Ever Saw The Northern Lights. Well, False. – I’m pretty sure if you see an aurora in Indiana it isn’t the “northern” lights, but other than that, yeah. Plus he properly quotes Simpsons and it applies perfectly. Excellent usage. These pretzels are making me thirsty. – From the same blog as the link above it’s a video of Seinfeld quotes (which I didn’t watch) and a video of Simpsons quotes (which I did). All the Simpsons quotes are from the early years so if you’ve got 2:29 to kill you could do worse things with your time. How Air New Zealand Started the Process of Creating a New Cabin Environment – A consulting firm working with Air New Zealand identified several passenger types by associating them with Simpsons characters. I don’t think this has as much to do with The Simpsons as it does with a consultancy knowing how to brand something, but it’s kind of neat. George H.W. Bush, Barack Obama, The Simpsons and the perils of being a “really good one-term president” – This guy’s a lefty worried about President Obama, he cites “Two Bad Neighbors” to help make his point. Mayor Quimby, Homer’s alcoholism, and the federal budget – This guy’s a righty angry at Obama, he mentions two Zombie Simpsons episodes to help make his point. I’m not sayin’, I’m just sayin’. While it may have been impressive in the cinema, 3D would have detracted from a film packed with the type of gag rate and gooey centre that hasn’t been around since The Simpsons jumped the shark at the turn of the millennium. Skinner: I’ve always admired your tart honesty and ability to be personally offended by broad social trends. A great quote that’s perfectly cited, bravo. Simpsons Mashups. – This doesn’t have links to the original sources (some of them have deviantART watermarks), but this is a pretty spectacular collection of Simpsons crossover art. Something feels wrong here. – Knockoff “Bant” t-shirt featuring Evil Eyes. The Simpsons – Itchy & Scratchy Land for BlackBerry – Pretty much exactly what it says. See My Vest! – I find Hulu more annoying than YouTube, but video is video. Bomb Lego Sculptures » lego3 – Awesome, life size versions of Bart & Milhouse done in the medium of Lego. Despite The Simpsons showing us that truck drivers don’t actually do their own driving, Otto’s driving record must’ve convinced legislators that there needs to be a ban on texting behind the wheel for truck and bus drivers. Taken on its own with no context I’m not even sure what that sentence means. John Swartzwelder is arguably best known for writing a good hunk of Simpsons episodes back when they were still considered good. At least, considered good by people I consider good. Fans of the current Simpsons episodes I barely consider at all.